Sts. 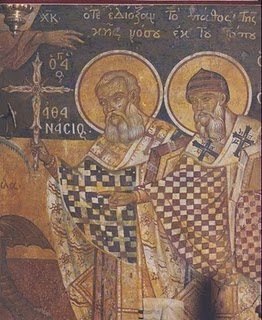 Athanasius and Spyridon banish the plague. This plague struck Kerkyra in 1629-1630. Fresco probably from the 17th century at Upper Korakiana, Kerkyra in the Church of Saint Athanasius. 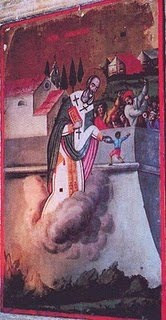 St. Athanasius saves a child on the walls of the old city of Kerkyra. St. Athanasius was the patron saint of Kerkyra until 1456, when the relic of St. Spyridon came to the island. Fresco at Dukadon, Kerkyra in the Church of the Most Holy Theotokos Mesochoritissis.